Tuberculosis (TB) is an enormous global health problem, even though Mycobacterium tuberculosis (Mtb) causes symptomatic (ìnactive), transmissible disease in only a subset of persons that become infected. In the remainder, Mtb is considered to cause persistent, asymptomatic infection, termed latent TB infection (LTBI). However, LTBI can reactivate and progress to active, transmissible and potentially fatal TB disease. Prevention of active TB in high burden regions would greatly benefit from a strategy to identify individuals with LTBI that are at highest risk for progression to active TB. However, despite the magnitude of the TB problem, it remains unclear why certain individuals cannot control infection with Mtb and progress to active TB, and others remain asymptomatic and healthy. Without this knowledge, it is not possible to identify those at highest risk of progression to active TB and prioritize them for preventive interventions. The goal of the Emory-led TBRU is to help eliminate TB through a comprehensive understanding of antigen-specific T cell responses and their relationship to distinct outcomes of Mtb infection, including mycobacterial clearance, prolonged latent TB infection (LTBI), or progression from LTBI to active TB disease. 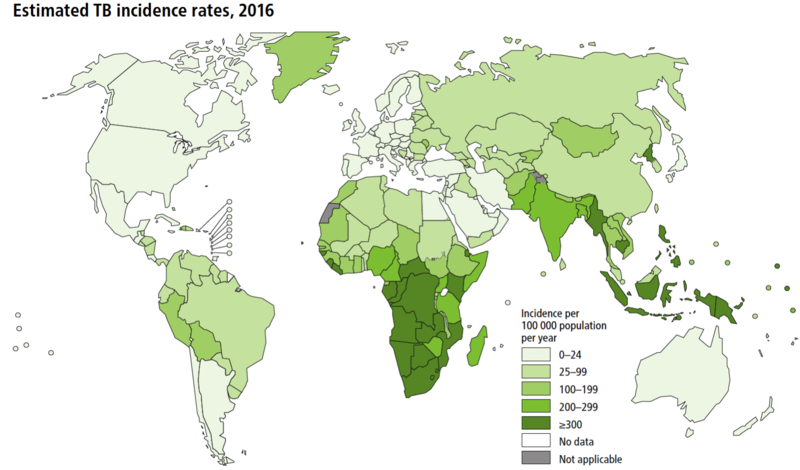 The above map shows the global distribution of tuberculosis incidence in 2016, and is from the 2017 Global Tuberculosis Report.